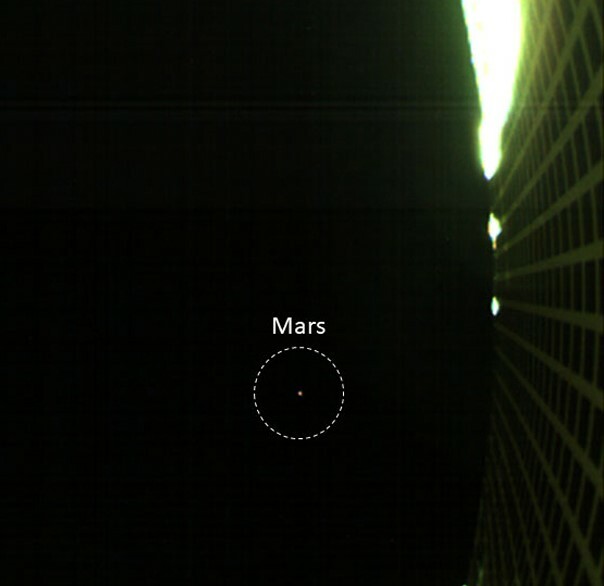 Mars looks like nothing more than a reddish speck in a picture captured by one of NASA’s twin MarCO spacecraft, but it’s the start of something big for small satellites. NASA says the image, released today, is the first view of Mars recorded by a class of nanosatellites known as CubeSats. The briefcase-sized probes are part of a mission whose name is a contraction of “Mars Cube One,” and were launched from California along with NASA’s Mars InSight lander in May. They’re officially known as MarCO-A and MarCO-B — but they’ve been nicknamed WALL-E and EVE because they use propellant similar to the fire-extinguisher gas that the WALL-E robot used in the 2008 Pixar animated film. Just a few days after liftoff, WALL-E’s wide-field color camera snapped a picture of Earth and the moon while checking on the deployment of its high-gain antenna. On Oct. 2, WALL-E did it again, this time looking 8 million miles ahead to Mars. The high-gain antenna can be seen to the right in the image, illuminated by sunlight. This entry was posted in GeekWire and tagged CubeSats, Mars, Satellites, Space. Bookmark the permalink.